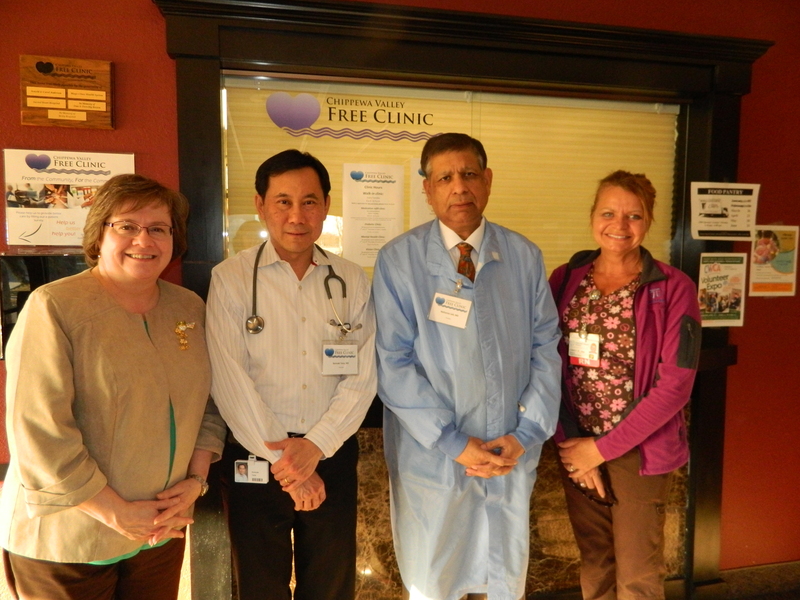 The Chippewa Valley Free Clinic (CVFC) is located at 1030 Oak Ridge Drive, Eau Claire, WI. It has a spacious reception area and five up-to-date exam rooms, as well as fully-furnished areas for medication dispensary, a nursing station and lab, patient interviews, and office space. An electronic medical record system is used for patient health records. As a primary care clinic, it serves individuals who are uninsured or underinsured, provides health maintenance, helps people manage chronic illness, and provides minor urgent care. In 2018, there were 2099 total patient visits (An average of 175 patient visits a month), 61% of whom were employed; most patients were 25-36 years old. Although the CVFC employs seven paid staff members (most of whom are part-time), it is dependent primarily on volunteers. Over 190 individuals volunteer their time and expertise. Volunteer activities occur largely in two areas: (a) health care, such as physicians, nurses and nurse practitioners, social workers, and lab and pharmacy technicians; and (b) clinic support, such as receptionists, administrative assistants, food providers, and interpreters. Volunteers also serve in the medical director position and as board members and contribute to special projects. The CVFC was established in 1997. A small group of compassionate, forward-thinking community leaders came together to create a health care service for uninsured and low income individuals. The Clinic has been generously supported by various contributions and grant awards: (a) fifteen years of rent-free space from Valleybrook Church, (b) United Way of Eau Claire, (c) Visiting Nurses Association/Combined Health Care Services, (d) Wisconsin Community Development Grant, (e) UW Medical School, and (f) Baxter Foundation. In 2012, the Clinic was relocated from 421 Graham Avenue in downtown Eau Claire to a location on Richard Drive. The Clinic then moved back downtown for brief period, calling 816 Porter Avenue, Suite 200 home before moving to its current location. Our permanent home is now in the professional medical district just off West Clairemont Avenue near Marshfield Clinic and HSHS Sacred Heart Hospital at 1030 Oak Ridge Drive, Eau Claire, WI 54703. See the most recent annual report.